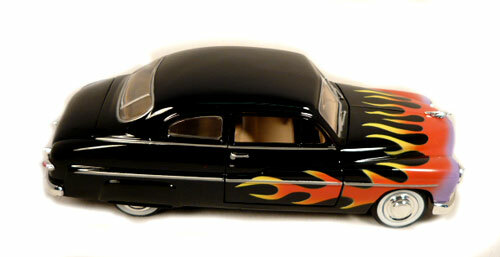 This die cast model of our 1949 Ford Mercury Hot Rod 1:24 Scale is by Motor Max collection. It has a tan interior with bench seat, detailed dash board and a black steering wheel. The hood, doors and trunk open on this die cast replica. The engine is chrome and it has three tone flame on the front and down each side on a black paint job. It has chrome moon hub caps and white wall tires with working front turning suspension..